Also available, Spicy Mustard and…Ketchup…..If you MUST! moved to Tinley Park and attended Carl Sandburg High School and graduated from Andrew High School. Later, I graduated from SIU in Carbondale after two years at Moraine Valley CC. My mom was from Cicero and dad from the near west side. I then moved to the south 26 years ago and still craved the Chicago food I grew up on. So, half of my life I have tried to get the real, authentic Chicago food that I grew up on. Unable to find it, I decided to take matters into my own hands. 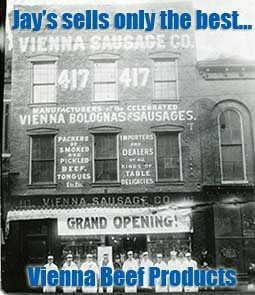 Check out where my Jay’s Chicago mobile food cart will be located on JaysChicago.com, Twitter, and Facebook. If you would like to book Jay’s Chicago for private or community events, give me a call. Thanks, I look forward to serving you soon. Cash preferred, Visa and MasterCard accepted. Sales tax will be added to credit card transactions.